Came across your very beneficial blog ,and it really did help me understand much more about sesmoid bone fractures than any doctor I went to. Let me start with a brief history.I am 43 yrs old Asian female and I've been a diabetic for 10 years now.In October 2015 I felt tingling and burning in toes of both my feet.This became okay by December 2015. 1st week of January, I slipped on the floor in supine position but did not feel any pain anywhere after the fall.Within a few days I started feeling tingling,burning sensation only in my left foot. Then I felt a buzzing sensation, a feeling that my shoe has water in it,a feeling that I'm walking on stones.All these sensations didn't last for many days.I felt heaviness and pain in my whole leg just for a couple of days.At the same time I started feeling a dull ache in the ball of my left foot, which would increase when I would go for my regular walks By end of January I could not drive , as it would send excruciating pain through the ball of the foot. I was given Pregabalin-M,the ball of foot pain still remained. February 14th after having danced I had terrible pain in the ball of foot one couldn't even touch it with a light hand.There was swelling on that part too.The orthopedic surgeon I went to ruled out a fracture and began treating me for a diabetic foot infection. He put me on antibiotics and anti inflammatory medicines for 15 days and advised rest for 3 weeks. No cast, no special foot wear. I went to another orthopedic surgeon a friend who without an xray told me that it was a stress fracture of the sesmoid bone and that I need not bother about this condition and should carry on with my regular activities and walking.However even restricted activity inside of my house was causing me a lot of discomfort so I refrained from going out for my walks. By mid April I felt quite alright and when I had no pain for about 4/5 days I went for a walk.I was fine do I went again the next day.The day when I was going I realised that I just couldn't walk! An X ray confirmed a fracture in the medial sesmoid of the left foot. Again someore anti inflammatory and anti biotics were given to me.He also advised me to soak my foot in icy water. I did not respond well to this treatment and was then referred to another doctor who advised me complete rest for three weeks ,and some more anti inflammatory medicines. By the end of three weeks with ultra sound treatment and contrast bath,I am better than before, have got special insoles for off loading which are not much help As soon as I start walking the pain begins. From February to now my life has completely changed I barely walk a few steps each day and end up in pain.Sometimes I fear that this condition will never change.I definitely do not want a surgery .There are no bone stimulators in this part of the world. After reading your blog i have started taking milk and curd. Will be waiting for your valuable advice on my condition. PS They make it clear it is not just for nerve pain, but other sources of pain like arthritis, etc. Morton's Neuromas are inflammed swollen nerves in the front of your foot , usually found between the third and fourth metatarsals (as seen in the above MRI), and sometimes between the second and third metatarsals, and sometimes between both. You count the metatarsals from the big toe #1 to the pinky (baby) toe #5. The symptoms from these inflammed nerves are nerve symptoms: burning, tingling, numbness, electrical, radiating, buzzing, sharp, and/or feeling like a rolled up sock. They are abnormal sensations, also called dyskinesias (just to show you how smart I am). But, this pain may be not be from the foot at all. Nerve pain in the foot can originate from nerve irritation at the ankle, knee, hip, or low back. Nerve pain in the foot can also be systemic (from the body) called peripheral neuropathy. So, it can be very challenging to diagnosis the source of pain in many patients, and thus treat it properly. Any workup for nerve symptoms in the foot should look for possible causes other than the foot. Photo shows typical problem between 3rd and 4th metatarsals. One of the mainstay treatments of Morton's Neuromas involves injections. There are three common shots, and other combinations of medications used in injection form. First of all, there is the diagnostic injection of local anesthesia (like novacaine) to see if injecting the nerve gives complete pain relief. It sometimes proves that the nerve the doctor thought was the problem really is not the problem. These local anesthetic injections should be given with medications that last around 5 hours (commonly Sensorcaine, Marcaine, or Bupivacaine) so that the patient can be 100% sure of the relief attained--100%, 80%, 50%, 30%, or 0%. I am a big believer in this method of identifying the right nerve, if it is a nerve at all, since you only inject the nerve and not the tendons, ligaments, joints, etc. Sometimes, even though you are giving an injection which should last 5 hours, since you are blocking the pain cycle, the relief can be much, much longer. Many doctors will give these injections once or twice a week until the severe pain cycle is completely broken down and the symptoms greatly minimized. The second most common type of injection involves cortisone. No one knows for sure how much should be given, since that varies from person to person and body part to body part, but I have lived by the rule of no more than 5 shots per year. I can count on one hand how many patients have needed more than 3 per year, so 4 or 5 shots is unusual, but sometimes necessary. Each one of my cortisone shots is 10mg of long acting steriod. Long acting means that some of the medication is still working for 9 months. As the crystal dissolves, there is slowly less cortisone working on a daily basis. Cortisone can allow healing to occur since it removes swelling. Swelling is our enemy. Swelling cuts off the normal circulation to an area inhibiting healing. So it it more than just a bandaid or temporary fix--it can fix the problem!! I find no use for short acting cortisone. It only lasts for 3 days or so. So what? If you think the patient needs cortisone, use the good stuff. I once had a patient come in for surgical consultation after she failed to improve with 10 cortisone injections over a 6 month period. Surgery had been recommended, and I was a simple appointment to verify that this was appropriate. When we found out what the doctor had used in each injection, I was dumbfounded. He was using long acting cortisone, but in a homeopathic dose of 0.1mg per shot. If you do the math, you would realize that it would take him 100 shots to equal the dosage of one of my shots. Oh my!!??!! Why am I discussing dose? Because you should know if you are getting a foot or ankle shot, if it is long or short-acting cortisone, and how much? The 5 dose recommendation per year is based on actually getting 50 mg of long acting cortisone in one area. It does not mean that you can not get the same amount in another area of your foot. One smart patient, with one smart doctor, helped me understand that a local cortisone shot can affect the entire body since small amounts do get absorbed into the body. I call this Dorothy's Rule, after one of my patients, that a patient should not get more than 1 shot of long acting cortisone per month for their entire body. I like this rule since cortisone does affect us in many ways. This applies to patients whom are getting cortisone shots for their foot, and at the same time for their knee, shoulder, etc. 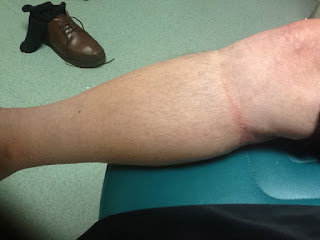 When giving cortisone shots the doctor should stay away from the skin, buring the injection as deep as possible, and avoid tendons if possible. Cortisone near a tendon can weaken it, and cause tearing, as it can thin the skin. The skin usually gradually gets healthy, but can take 9 months or longer, and can not tolerate further shots at this time. Cortisone is normally mixed with the long acting local anesthetics to get 5 hours of post shot pain relief. If the patient does not feel any relief after the shot, the shot missed the painful spot. After cortisone, patients are told no running or jumping for 2 weeks (another reason athletes hate cortisone shots). The patients are told to check pain relief in the first 5 hours, at a week, and at the 2 week followup. If the 10mg is not enough (with the goal 80% reduction in pain), a second shot is given and the two weeks starts over again. During these shots, I do not have the patient go to physical therapy, but they can cross train with non jumping and running activities. With many activities like cycling, they have to assess if it has a negative impact on them. During these shots, the patients are told to ice the area 3 times daily (see separate post on icing). At each two week interval, if the patient seems to be at the 80% level (familiarize yourself with a pain chart and read the separate post on the Magical 80% Rule), activity is gradually returned. Hopefully, the doctor and patient have learned what to avoid, what to wear in the shoes, how to tape, etc, to minimize the re-irritatation during the return to activity program. Any cortisone shot after the first shot in the 9 month window of time is considered a booster shot. The third most common type of shot is to desensitize the nerve with alcohol. We use to teach that the alcohol would kill the nerve, but it has been shown only 40% alcohol will do that. Most podiatrists do not feel over 20% alcohol is safe for the foot, so many podiatrists never risk injury by staying at 10% max. You definitely do not want to damage other structures in your attempt to desensitize the nerve. How long does this desensitization last, not sure, but typically for years. The jury is still out. I mix long acting local anesthetic with 100% concentrated denatured alcohol to achieve a 6% alcohol solution. Then 1 ml of this solution is injected at the most proximal aspect of the nerve in a bolus (not spread out as taught earlier). You attempt to hit the thinnest part of the nerve before its thickens to become the neuroma. Topical cold spray is used to anesthetize the skin, so 100% of the medicine is deposited along the nerve. These injections are given in series of 5, each one 7 to 10 days apart. 50% of patients get excellent results, 20% good (some improvement) and 30% none. After each series, 1 month is recommended to rest the soft tissue. If the patient noted no response from the first series, a second series is not normally recommended. Of the patients alcohol helps 20% or so need only 1 series of 5 injections to feel 80% better, 70% need 2 series, and 10% need 3 series. I know this is alot of numbers, but I love numbers, and this is my blog!! As with the photo at the start of this article, the bigger the neuroma on MRI, the less likely the alcohol shots will work. But, the art of all this is deciding who has a chance. 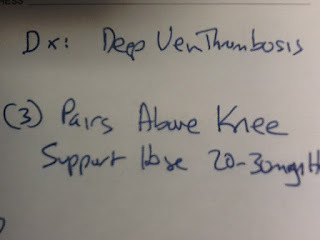 If it was my foot, I would go through the alcohol series to achieve the 80%, and if 80% were not achieved, I would get sporadic cortisone shots, get great orthotic devices that take pressure off the area, ice my foot 2 to 3 times daily, and do the other things on the Morton's Neuroma link below. You can also give the cortisone shots while doing the alcohol shots if there is an unexpected flareup.I sure hope this helps. I found you via you tube where I was searching for 2nd metatarsal stuff. I have a very sore left foot. Just the 2nd toe/metatarsal area. I had prior bunion surgery about 7-8 years ago. It was done by an orthopedic doctor. I have went to see his partner this time (who specializes in feet/ankles). He recommended metatarsal pads. They did not help. My foot has gotten progressively worse (feels like I'm walking on a painful rock). I am wearing an orthopedic shoe. I recently saw him again and he said it is a "functional" foot issue and I need surgery. I'm only 50 (lol) and I don't want a pin sticking out of my foot for 4-6 weeks. My 2nd toe isn't a hammertoe, but it doesn't rest on the ground like my other toes. Do you have any other suggestions? Aside from surgery??? Whereas the pain from metatarsalgia tends to be very generalized, capsulitis with or without plantar plate tears tends to be very localized to the bottom of one of the joints. Below is an example of an accommodative pad being applied to a pre-existing orthotic device in an attempt to float or off weight the area. Ice Pack for 15 minutes 3 times per day on the bottom of the foot, and change the last icing to contrast bathing as the symptoms improve each evening. Purchase Budin Splints, small longitudinal medial arch Hapads, and small metatarsal Hapads to experiment with immobilizing and off weighting the sore area. 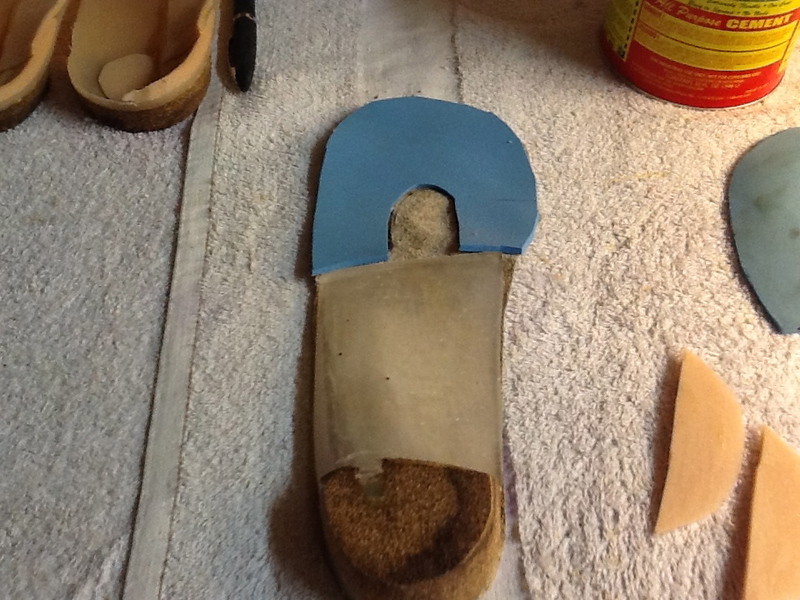 Mark the sore area with lipstick, transfer to the shoe padding, and try to accommodate the sore area. You can purchase 1/8th inch adhesive felt from Moore Medical to achieve this well. Analyze your shoes to see which types feel the best and stick with these. Stiffer the better is a general rule but may not apply to you. Experiment with buddy taping the most involved toe to the toe next to it (not to the first toe however), or do a version of spica taping for those two toes to restrict dorsiflexion. Use activity modification principles to keep fit. Ride a bike with the pedal on the heel or arch. Use an elliptical without raising the heel off or using any elevation. Swim without pushing off the wall or walking in the shallow end of the pool. Purchase an Anklizer removable boot if symptoms are not controlled in shoe gear. If the injury was traumatic, like with a fall, or if there is a marked amount of swelling, or an inability to bear weight, seek advice on getting an MRI and baseline x rays. If the toe involved has moved to a different position, it is the sign of a displaced fracture or torn ligament, and you should immediately seek advice of a podiatrist or orthopedist. I'm a professional Rugby League player in England and have recently ruptured my Plantar Plate Ligament under my 2nd toe. The toe keeps coming out of joint and under the 2nd metatarsal head is very painful. I have 8-10 games left of the season and would like to play in the remaining matches. I can have a local anaesthetic for games but during the week when training i can't. I've tried all sorts of taping trying to keep the toe from coming out of joint and pulled down toward the floor but haven't found a suitable one that allows me to train properly. I wondered if you had any advice on taping techniques or some kind of splint that may help me get through the next few weeks. 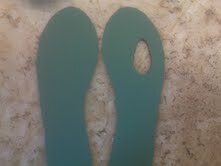 I'm having orthotics made to offload the pressure on the 2nd met head. I'm desperate for advice. I'm 17 wks pregnant and after 10 mos of misdiagnosis and on/off pain, I was informally diagnosed with plantar plate tear of 2nd MT. My MD said since the pain has been present for 10 mos, the likelihood of it healing on its own is slim. The joint is more lax dorsally than the uninvolved side and I have a mild hammer toe deformity. I started wearing a walking boot a week ago, and it provides almost complete pain relief. I am a physical therapist. Really want to avoid surgery. Does this sound like it could repair itself? Does it sound like a grade 2 or 3 tear? Will have to wait to get MRI until after pregnancy. Thank you! Sorry for your problem, and congratulations on the pregnancy. I have 2 wonderful unbelievable boys, and can not image life without them. You have a wonderful journey ahead. They will grow, but you also. Only an MRI will tell us grade 2 or 3, with grade 3 being a complete tear of the plantar plate. Unfortunately, due to your pregnancy, you must wait. The walking boot is now your gold standard. It has proven you can produce a pain free environment for healing. You must use it on and off for 3 months, unless you can find a shoe that gives you just as much pain relief. Consider looking into hike and bike cycling shoes with rigid soles, or hiking boots, or getting a Otto Bock carbon graphite shoe insole and see if it works in your athletic shoes. But, whatever you are walking in, we must create a pain free environment over the next 3 months to try to create a great healing environment. During that time, you ice pack the area from the bottom 3 times a day for 15-20 minutes. This daily program reduces the inflammation, both the acute (daily), and the chronic (built up over the last 10 months). Begin to experiment with Budin splints to get the right tension and decide if you put over the 2nd toe only or over both the second and third toes. Sometimes, I will use the double Budin splint and place over the 2nd and 4th toes with the two loops. You will be wearing the Budin splint while you strengthen the area for 2 years. 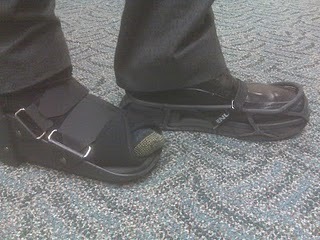 Some of my patients run marathons in these splints. As the pain calms down, and you get into more normal shoes, if the Budin splint is not enough protection, then you need to experiment with Hapad Longitudinal Medial Arch Pads or a custom foot orthotic device to perform that function. The most important thing to do right now, and for the next 3-4 years is daily Metatarsal Doming Exercises. This will strengthen the bottom muscles probably 3 times more than they were, but it is important not to curl the toes. It can take the next 1-2 months just developing the ability to keep the toes straight before you actually dome. Runner's knee, also called biker's knee, dancer's knee, chondromalacia patellae, etc, etc, has always been treated successfully in sports medicine practices with a multifactorial approach. This article bears that out. Key are exercise, bracing, taping, local treatments (maybe), and foot orthotics. From a podiatrist standpoint, it really means you need to treat the biomechanics. This includes limiting knee flexion, limiting over pronation, changing technique flaws and holding the knee cap in its proper femoral groove. As a podiatrist I primarily dwell in the world of making lives better, but rarely save a life. Almost weekly I experience patients in the wrong length or fit of support hose, and the consequences of blood clots and pulmonary emboli could be life threatening. I implore all of my readers to look at their loved ones who wear support hose and make sure that their circulation just below the knee is not being cut off. Poorly fitting knee high (aka below the knee) support hose in my patient Bruce being treated for a deep vein thrombosis. 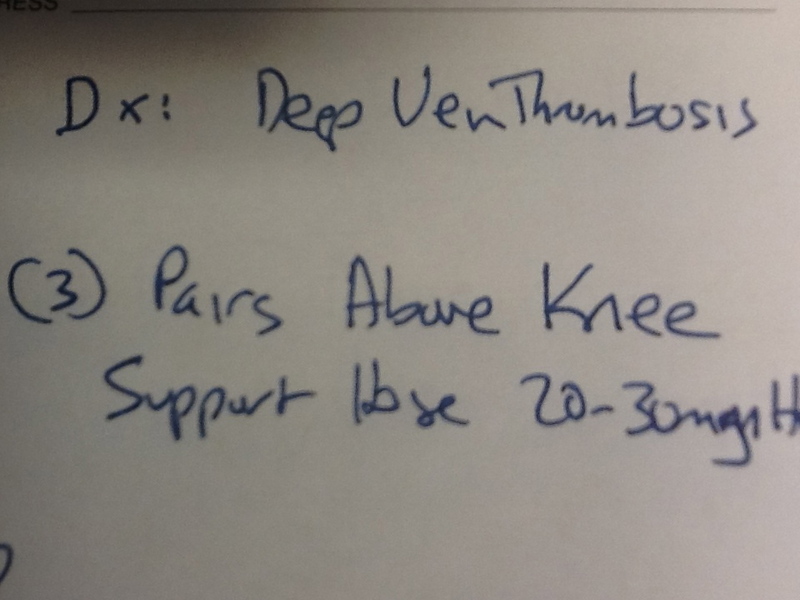 The New Rx I scribbled for Bruce to change to Above the Knee Support Hose (aka Thigh Length) with the same pressure. The pressure is in mm Hg (millimeters of Mercury). Sorry for the scribble. Will I save Bruce's life with this simple change? Who knows? But, I can sleep well at night for checking. Please pardon my previous email as I wanted to take this oppty to clarify that I did not mean for you to spend any time reviewing options; I just meant to ask if you typically recommend ONE particular model for say, Hokas brand, because I didn't know if ONE model or ANY model Hokas is good for sesamoid. Hokas offers one WIDE width shoe: Hoka One One Bondi 4 Wide. Crocs offers the " Crocs RX Ultimate Cloud"; this model is very highly rated and made of Croslite material (conforms to foot creating a custom fit). Crocs also offers a few more "Rx" models that may be helpful for fellow sesamoid-sufferers. Wednesday, I mailed my CT CD/report to you and hope you can review it when you have time. Thank you again for your help and support, it is greatly appreciated. My 18 year old daughter suffered an injury mid February while dancing. For five weeks, it went misdiagnosed so nothing was done except to stop dancing. At five weeks of no improvement, it was diagnosed as a medial sesamoid bone fracture and she started using a walking boot with crutches non weight bearing for three weeks followed by three weeks of walking in a stiff soled padded shoe to take weight off the sesamoid bone. She also started vitamin D and calcium supplements. An x-ray taken at the end of the six weeks showed bone resorption and widening of the fracture. (The fracture is 3/4 of the way through the bone from the bottom). She was placed back in the boot for four weeks weight bearing (no crutches) and started on an Exogen bone stimulator 20 minutes daily. This week, an X-ray was taken and the fracture has not improved and may even be worse. Her doctor advised us to continue with the walking boot for another three weeks, continue bone stimulation then progress to a supportive shoe with padding to offload the sesamoid bone. He will see us again at the end of six weeks. I should mention that in the walking boot and padded stiff soled shoe, she is able to achieve pain free walking and she has very little swelling. The rest of the bone on X-ray appears to be of normal density. For the past three weeks she has also been riding the exercise bike daily. Dr Blake's comment: You and the doc has done well to achieve a pain free environment to maximize the chance for healing. The xrays are so bad at following these injuries, since the healing process brings increased fluid into the fracture area making it appear worse (less white) when most of the time it is healing just fine. All along, our doctor has been rather encouraging, but this appointment he was not and even consulted with a surgeon who said to continue what we were doing as surgery, which is the last option, may decrease function and she would not be able to dance again after. Dr Blake's comment: I do not agree with this. You lose some flexion function, but you can work on recruiting the tissue not involved to help. I do not think if she had surgery it would end her career. Of course, the younger the patient is the less anyone wants to have a complication which could result in a career ending surgery. But, that is not the expected. My question for you is, is there still hope that this bone can heal, especially if the space has widened? Is there anything else, we should be doing to help her heal? Do you recommend that she use the walking boot longer than advised? Do you think that she will ever be able to dance again? Dr Blake's comment: She has a great chance it will heal, and we do not know if the gap truly is wider. Sounds like you are dealing with nutrition, bone stimulation, off weight bearing, gradually return to activity. Remember, as long as you stay in the 0-2 pain range, you are giving it a chance to heal, but you now need to add more weight, more stress, slowly and carefully, but consistently over the next few months. Have you mastered dancer's pads, and spica taping? You can find these all over my blog. I want a picture of her dancing full out some day. Thanks. Please keep me in the loop. Any advice that you give us would be very much appreciated. I am called in to help patients in cardiac rehabilitation programs all the time. Why would a podiatrist be involved in cardiac rehab you might ask? Well, many of these heart attack survivors have never exercised in decades. There good and kind heart doctors send them to rehab and they begin to exercise. Imagine the frustration with the severe cases of plantar fasciitis or metatarsalgia that prohibit them from exercising. There lives depend on their ability to watch. So, in comes the podiatrist on his/her white horse!! Pretty cool eh! !